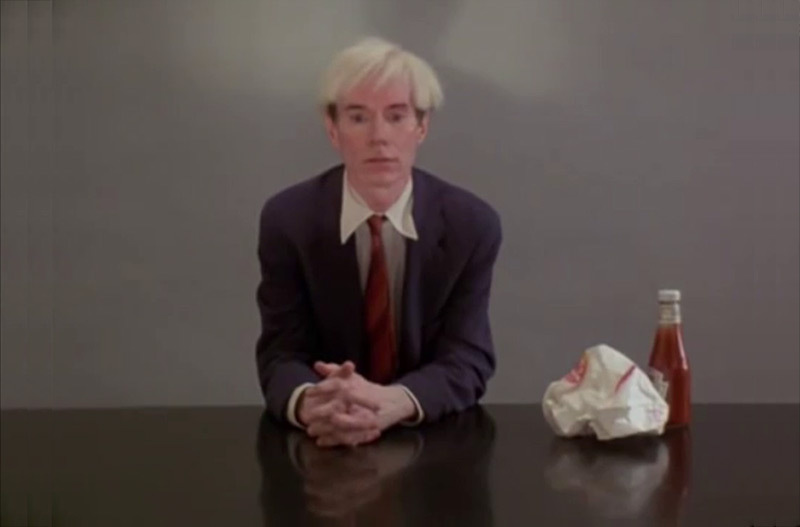 Videos Andy Warhol eating a Hamburger from the film 66 Scenes from America (1982) by Jørgen Leth, and Jørgen Leth on Andy Warhol eating a Hamburger; Two Scenes With Warhol And Eminem, Alex Da Corte & Jørgen Leth. Curatorial contribution and courtesy Louisiana Museum of Modern Art | Louisiana Channel. 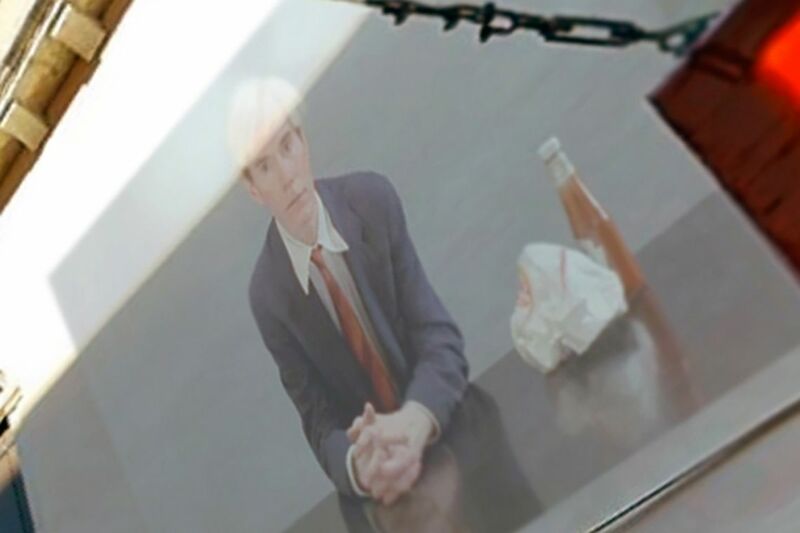 Still from Andy Warhol eating a Hamburger from the film 66 Scenes from America (1982) by Jørgen Leth. Courtesy the artist and Louisiana Museum of Modern Art. Andy Warhol (1928-1987) was a most prolific and popular artist of his time, and a leading figure of the visual art movement pop art. His works, which span across a variety of mediums such as illustration, painting, photography, sculpture, publishing and film, reflect celebrity culture and advertisement, which was flourishing at that time. Warhol and his friends staged theatrical multimedia happenings at parties and public venues, as well as at his studio, The Factory, which served as a creative hub for intellectuals, bohemians, celebrities, artists, writers and musicians. Jørgen Leth (born 1937 in Aarhus) is a Danish poet and film director, a leading figure of experimental documentary film making. He has written 10 volumes of poetry and eight non-fiction books, and worked as a cultural critic for leading Danish newspapers. He made over 40 films, many of them distributed worldwide. His most acclaimed is the 1967 short, The Perfect Human, which is also featured in the 2003 film The Five Obstructions made by Leth and Lars von Trier. Leth's sport documentaries bring and epic, almost mythic, dimension to the field. The VENICE INTERNATIONAL PERFORMANCE ART WEEK 2016 presents the videos Andy Warhol eating a Hamburger from the film 66 Scenes from America (1982) by Jørgen Leth, and Jørgen Leth on Andy Warhol eating a Hamburger; Two Scenes With Warhol And Eminem, Alex Da Corte & Jørgen Leth. Jørgen Leth directed the film 66 Scenes from America in 1982, a personal subjective impression, acutely sensed and perceived. The approach has been to register whatever exercises a fascination and place it in a surprising context. In Leth's own words about the film and the Warhol scene: "A documentary about the USA today. It embraces major and minor impressions, events, things, people, thoughts and feelings. It is a collection of pictures of a country which in many ways is strange and incomprehensible to us, but in which we nevertheless recognize a reflection of our own culture, and to which our dreams whether we want them to or not must bear a relation. ... [Warhol] told that he has to say his name and that he should do so when he has finished performing his action, but what happens is that the action takes a very long time to perform; it's simply agonizing. I have to admit that I personally adore that, because its a pure homage to Warhol. It couldn't be more Warholesque. That's of course why he agreed to do it."